How do I make a donation during a Giving Day? Click on "Search..." in the upper middle of the page and search for an organization, or click the "Give Back" button in the middle of the page to be brought to a list of all of the organizations participating in a Giving Day. From the organization's profile on the Giving Day website, click on the "Donate" button, "Choose Your Own Amount" button, or any of the tiered options to make a donation of your choice. Note: Choosing a tiered option will pre-fill the intended donation amount, and will notify the organization of what you wish for your donation to go towards. (a) Adjust your donation amount. (b) Change the display name of the donation. (c) Remove the display name of the donation. (d) Remove the display amount of the donation. (e) Make this gift each month until it is manually cancelled. (f) Make this donation in the honor of, or in the memory of someone. (g) Add a message to the donation. (h) Contribute your donation to an ongoing campaign at the same time as the giving day. 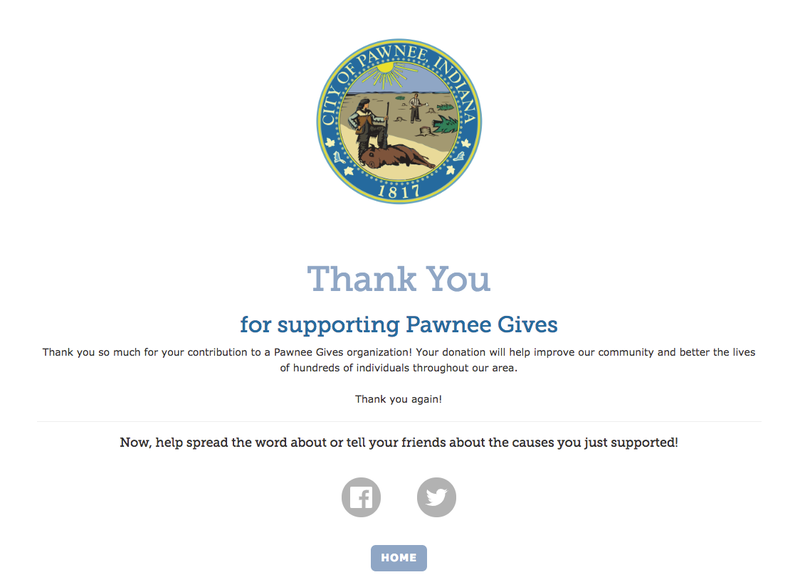 (i) Make a gift to another organization at the same time. 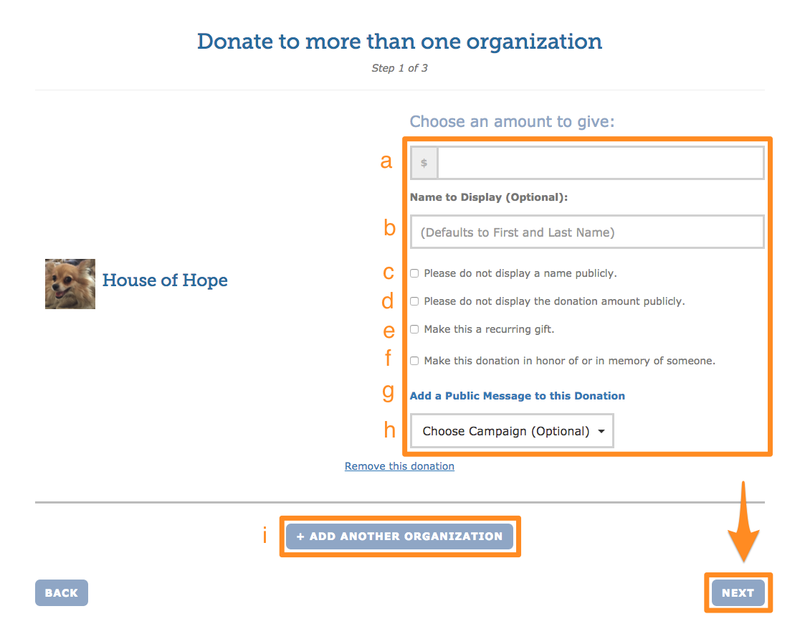 After customizing your donation, click the "Next" button to proceed to the next step. 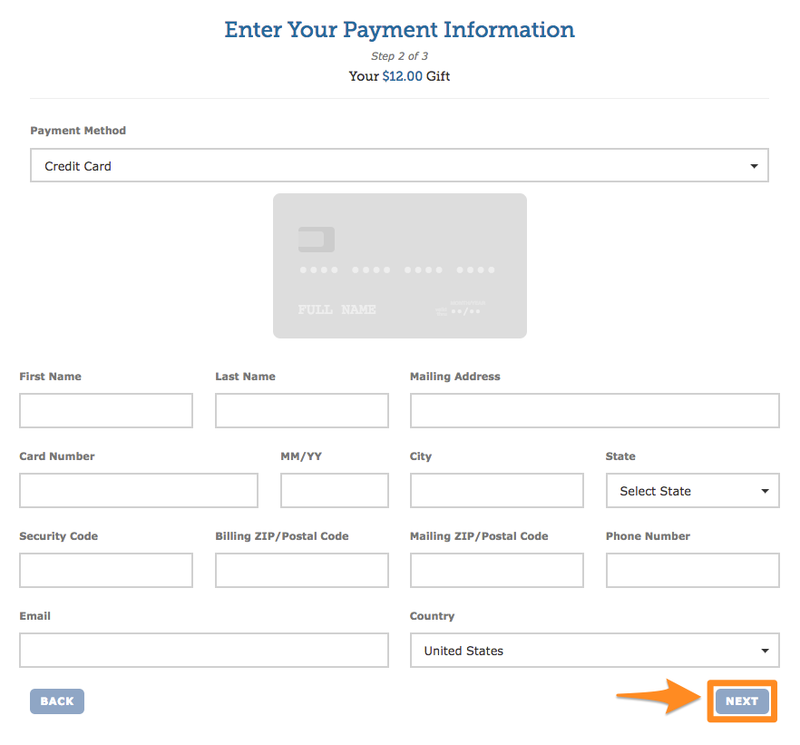 Enter your credit card information, mailing address, and hit the "Next" button. Note: Your email address is required so we can send you a tax-deductible receipt. Note: If you're not located in the U.S., you will be able to select another country from the "Country" dropdown box, and you'll be able to continue the donation process from there. Review your information to ensure that it is accurate. You will also have the option of covering the associated fees that will be incurred to the organization. The platform fees vary, but the credit card fee is a flat 2.2% + $0.30. Once you are sure the information is accurate, click the "Submit" button. 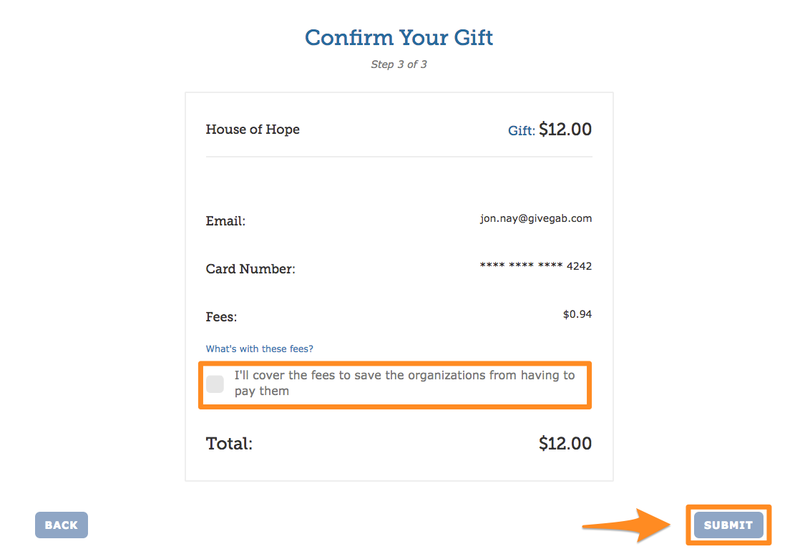 Once the donation is completed, you will receive one receipt in your email inbox for every organization you made a donation to. Note: If you need a more in-depth explanation of some of the fields or boxes that are in the donation steps, check out this support article!